Facade fragrances, of which there are MANY, niche and non-niche, load all their interesting and expensive bits up front; they are designed to ignite perfume-lust at perfume counters so consumers will buy quickly. If consumers dawdle, they witness all wit, heft and quirkiness fading from smell, and they're left with heaping helpings of white musk, Ambrox, Iso E Super or Cashmeran. Nasomatto Baraonda is a facade fragrance. Baraonda starts off with great notes; they smell pricey and "strange" (just the way I like it). There's a note I'll call 'coconut tobacco' (caramelized/toasty like burnt candy one minute, smoky like incense the next). Another striking note reminds me of musky, tart red berries and the pomegranate liqueur I use to add some garnet tones to a glass of prosecco. Baraonda smells like a pouch of deluxe cured tobacco scented with food-y notes (there's also a minute or two of "grains" and whiskey-like scent). If you are a "light sprayer" of fragrance, maybe one or two spritzes, you'll smell vanillic Iso E Super within 20-25 minutes of Baraonda application...and there you shall remain for the duration. 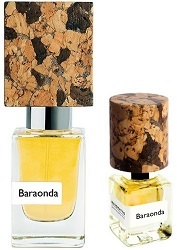 Since I like Baraonda's "face," I've learned to extend its presence by spraying lavishly (10 sprays) and putting on my shirt before the perfume dries on my arms and chest. Yes, eventually, what smells like vanilla and Iso E Super takes over, but not nearly as fast. If only Nasomatto put some real juniper/cedar in Baraonda's base and spared us the synthetic woods. Facade Fragrances don't ever join my perfume collection because, over time, I'd feel like I bought many bottles of the same fragrance, so obnoxious are the bases in these type scents. Is there a Facade Fragrance you love and wish had been "finished" in the proper way? If so, do tell. Nasomatto Baraonda is available in 30 ml Extrait de Parfum ($185) or (only at Nasomatto's website) 4 ml oil-based Extrait de Parfum (€42). For information on where to buy it, see Nasomatto under Perfume Houses. I love your “take no prisoners” reviews! I can’t think of a single facade perfume that I love, though I certainly own some. I have filed them under “mistakes” on the bottom shelf of my collection — below knee-level = harder to notice. I tell myself that one day I’ll get round to using them in a room-freshner burner thingy over a candle. Or something. Water, I use a few ‘mistakes’ as room fresheners, too. Ha! Kevin, I agree with everyone???? I would love to see your top 5 Facade Fragrances. Maybe we need a Facade Friday for the NST community project! Laura…my god…I should have kept track…there have been sooooo many. Nice terminology, I’ll remember this. I recently tried Barney’s Route du The. The citrus open was terrific! … but half an hour later it was all white musk. If only the citrus had kept going. This one’s definitely a Facade Fragrance. Pixel, that’s too bad…I wore that fragrance for years! Another admirer of your snarky reviews here, Kevin. And I think one can find whole facade perfume houses nowadays. “Facade Fragrance” – brilliant!! And just the other day there were comments on the SOTD post about trademarking phrases. I nominate this one. For me (and I know there will be disagreement here), my FF would be VC&A Bois d’Iris. Lovely, lovely iris devolving to…. you guessed it – white musk (aka Secret deodorant). Bleh! I’ll stay out of this one!!! Oh, sorry, I’d have been glad to send you the sample I had but I’ve already passed it on. No….???? VC&A Bois d’Iris is on my fb short list. But I like musk???? That’s my problem – I loathe musk! So you know how many otherwise great fragrances that lets out for me now. Even my beloved Guerlainade has been replaced by white musk. I know I’m not going to be popular in this one, but I found Mary Greenwell Plum to be a facade fragrance. I loved the opening, and then . . . meh. Nothin’ much goin’ on after that. Kevin, as you note, there are sooooooo many facade fragrances these days, it’s hard to pick or even remember one, but I’m going to call out the Ormonde Jayne line. Several of the fragrances are quite interesting initially, but then they all devolve into Iso E Super and smell way too much alike. I’m particularly bitter about OJ Woman, which starts out so bewitchingly. Noz, true…and that’s why I’ve never been tempted to buy an OJ. Ouch!! This is brutal!! But thank you for being honest – too many glowing reviews for crappy fragrances out there!! There is a handful of honest reviewers and thank you for being one of them. Clarissa: definitely sniff it if you come across it…I really enjoy the opening. White musk can feel like sandpaper (or an ice pick) to my nose, and Iso E Super sort of anesthetizes my sense of smell. I feel the facade fragrance pain. I don’t think I’ve tried anything from Nasomatto, but I do say “ooooh” every time I see their bottles. I love big caps. So at least there’s that. Although I guess the bottle is after all just another facade? Hmph. Hahaha! Love this. I read down to ‘let me give you my definition of a facade fragrance ‘ , and by the end I was saying I bet Kevin wrote that’ – and scrolling up to see if I was right. Love your posts! Second the facade fragrances post idea. I’d like to see your list beyond the Ormond Jayne line. Thanks again for being so refreshingly frank. missyl: THANKS! And you’re welcome! I am grateful for your negativity about Iso E Super. It truly is the new Calone and deserves to be regarded as such. When people look back at fragrance trends of the 2010s, they will see a wash of pale genderless “molecule” things. I’ll take the fruitchoulis any day. What’s worse is that people always compliment Iso E blobs the most. Every time I wear one, the comments on how great I smell pour in. It affects people who hate fragrance positively, because they can never be sure you’re actually wearing anything. So I did a double take – why was the reviewer starting with the word façade – oh hang on it’s Kevin – this is going to be good……. yup it is. In one week on NST we’ve been treated to Wood Pudding and Façade Fragrance – I applaud. And could not agree more about OJ frags. I believe Geza Schoen is responsible for many of those and his use of Iso E Super is well documented. It’s funny but I don’t mind Escentric Molecules half as much because at least they are upfront about their ingredients.